SIBU: Sekolah Menengah Kebangsaan (SMK) Lanang and Sekolah Jenis Kebangsaan Cina (SJKC) Thai Kwang emerged the overall champions of Sibu Division secondary and primary schools taekwondo championships (category Poomsae and Kyorugi) held at Dewan SJKC Chung Hua here recently. Dato Tie Chee Ping (back row, 8th left) presenting the overall champion trophy to a representative of SMK Lanang. 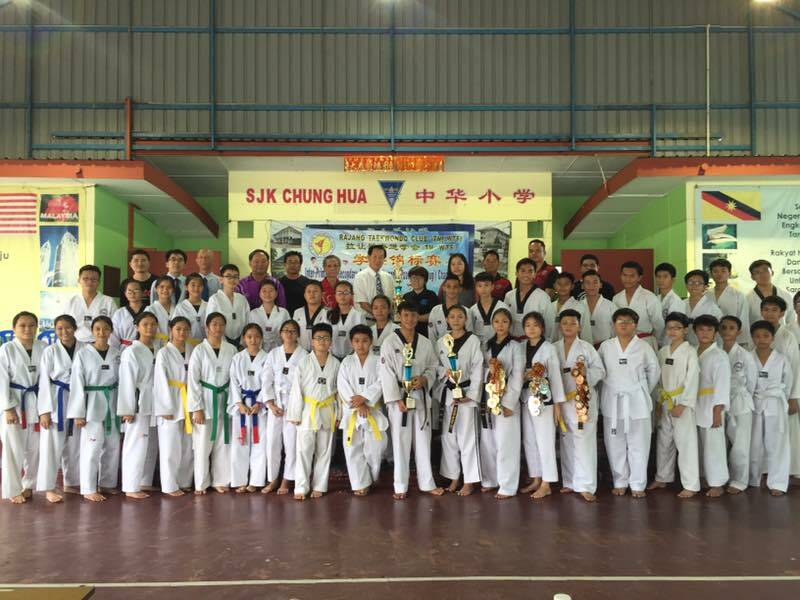 Organised by the Rajang Taekwondo Club, the championship saw SMK Lanang winning the secondary school category with 19 gold medals, 17 silver medals and 24 bronze medals. Thai Kwang were crowned as overall champions in the primary school category after winning 16 gold medals, 11 silver medals and 15 bronze medals. SJK (C) Thai Kwang won the poomsae events by amassing 10 gold, 8 silver and 11 bronze medals while winning 6 gold, 3 silverand 4 bronze medals in the free sparring events. 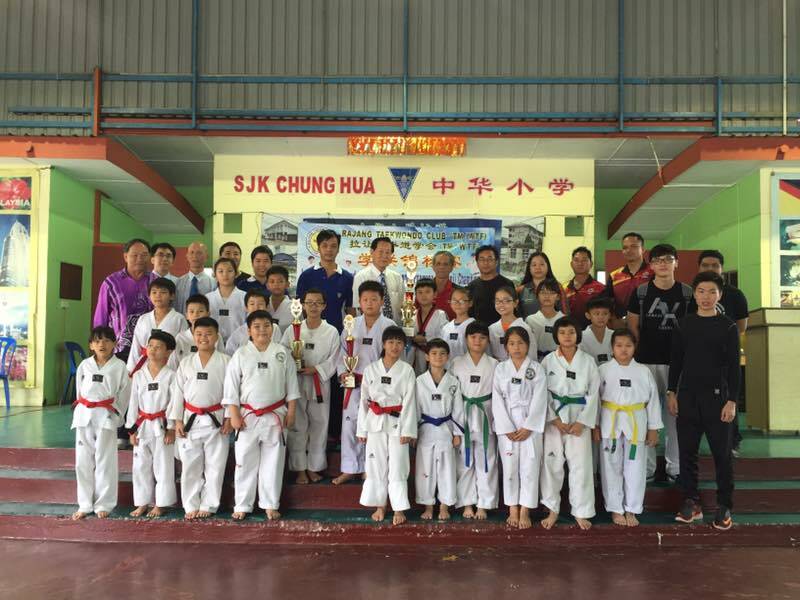 For poomsae primary school category, SJK (C) Chung Hua finished as the runners-up while SJK (C) Su Lai ended third and Rajang Taekwondo Club were fourth. Meanwhile, SJK (C) Chung Cheng were second for the free sparring event of theprimary school category. Meradong Taekwondo Club and SJK (C) Su Lai finished third and fourth respectively. SMK Lanang won the poomsae secondary school category with 11 gold, 13 silver and 14 bronze medals and the free sparring events with 8 gold, 4 silver and 10 bronze medals. SM Wong Nai Siong were second, followed by Rajang Taekwondo Club and SMK Deshon in third and fourth placings respectively. Rajang Taekwondo Club were second place in the secondary school Free Sparring category. Meradong Taekwondo Club and SMK Chung Cheng were respectively third and fourth. The two-day championship from April 15 to 16 was attended by over 300 participants from 16 primary and secondary schools in the central region. The chairman of the Board of Management of Primary Schools Bantuan Cina of Sibu and Kapit, Dato Tie Chee Ping gave away the prizes. Also present were the head coach and secretary of Rajang Taekwondo Club Secretary, Thomas Tang. Dato Tie Chee Ping (back row, 7th left) presenting the overall champion trophy to a representative of SJK(C) Thai Kwang team. SMK Lanang, SJK Thai Kwang (C) win Sibu taekwondo championships 0 out of 5 based on 0 ratings. 0 user reviews.